thru the years I have tried just about every brand of knife out there, helvie, denny, dunkle, cape forge, custom made knives from England and Scandanavia, every kind of steel I could come up, knives I made myself from old saw blades etc. 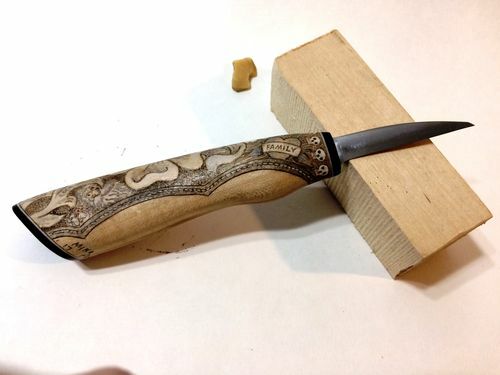 The result, and maybe IM pretty naive, but I have paid 300 for a custom made damascus steel knife and it doesnt cut any better or hold a edge whatever than the knife I made from a saw blades. I like Deepwood Ventures knives, price is reasonable and they hold a edge etc.. The best of the bunch for me at least is cape forge. I should have saved all the money I have spent on custom stuff thru the years and stayed with Cape Forge. Just curious what other carvers think, and how they resolved this. Oh and I have tried the super steels etc and other than being hard to sharpen Im just not that impressed. I dont mean to advertise for Cape Forge or anyone else and I think at one point I got in trouble at another forum because people thought I was advertising one over the other. Dont mean to do that and if the admins here decide to delete this so be it, but Im curious as to the pitfalls other carvers have had, particularly when they order and use some of the custom stuff out there, the bushcraft type knives in particular. Well I’ve never used a Cape Forge knive I’ll look them up. My carving season starts soon for me I use helvie knives for roughing. Then is switch over to my detail knives. Diobsud forge I like the steel but what more important is the shape of the handle and the blade. All of those mentioned are good, but I am pretty fond of the Helvies, and I own more of those than others. Rich Smithson at Helvie will even make you a knife with the blade length and style you prefer, with the handle shape and size you want for a reasonable price . Mine was $45. Here is a picture of it, with the custom woodburning I did on the handle. I like my Drake and Shipley/OCCT knives also. Well now, that is one nice looking knife! Maybe I should do that with my Flexcuts. 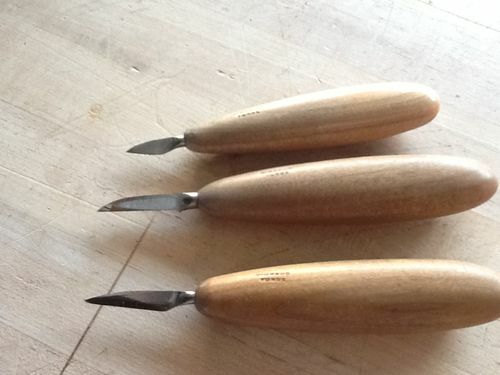 They are what I use, but I don’t do to much knife work; it’s mostly chisels. I don’t use them enough to justify getting high end stuff…yet. And may not. I have enough irons in the fire that I’m missing out completely on coppersmithing fun, these days. Cape Forge makes fine knives and gouges, especially for small work. Super easy to carry a kit, and their personalized service is outstanding. Mora knives come in laminated blades and are inexpensive. If you hone them well and strop well, they can be excellent. Their styles, of course, favor Scandinavian style carving—as in flat plane. I am practicing curved surfaces and I am starting to come up with curves made with very thin shavings. Small ridges left by the cutting edge disappear when worked with the back of the blade.